He maintains that the situational changes are not as difficult for companies to make as the psychological transitions of the people impacted by the change. Unlike earlier models such as Lewins, which speak of institutionalising or "freezing" behaviors, Bridges' attention is focused on helping people discover, accept, and embrace their new identities in the new situation. He theorises how these life stages can become a constant cycle of organisational renewal via the creation of a culture that embraces and nurtures change as a way of life. 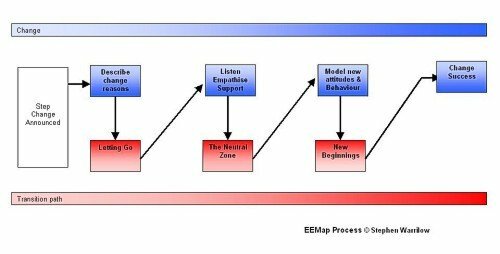 As with the Beckhard change equation, this is another example of a change model that recognises the basic psychology of change at the personal level, and that is people centred. 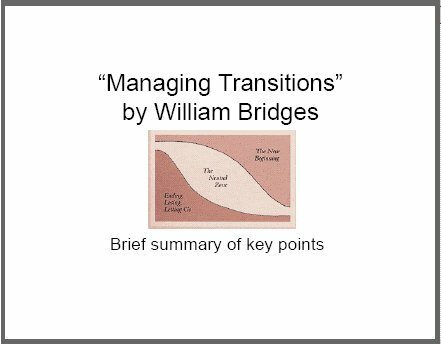 In the best-selling "Managing Transitions" William Bridges provides a clear understanding of what change does to employees and what employees in transition can do to an organisation. When the book was originally published a decade ago, William Bridges was the first to provide any real sense of the emotional impact of change and what can be done to keep it from disrupting the entire organization. One of the main points that William Bridges makes in his book "The Way of Transition " is that transition is different to change. Change is an external event i.e. it is what happens to you, whereas transition is an internal experience i.e. it is how you respond to what happens to you. 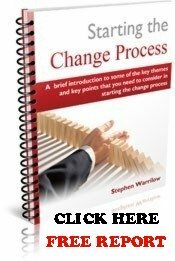 The main theme of this site, and all it's supporting material, is that change management is about process and people, and specifcally about processes that work for people. In my experience, senior management's failure to take full account of the people impacts of a change initiative is a significant cause of failure. William Bridges focuses on the transitions and the psychological changes that lie behind significant organisational change. Bridges draws the important and frequently overlooked distinction between change and transition. Bridges sees change as situational and transition as psychological. In my experience and in my view - it is the people related issues that lie behind the staggering and consistent 70% failure rate of all significant organisational change initiatives. "A change can work only if the people affected by it can get through the transition it causes successfully." So many times I have asked the question of directors considering some form of change initiative: "Why are you doing it and how will it benefit you and how will you know it's benefited you?" - and got a vague or general answer along the lines of "we'll be... bigger... better... closer to our customers... reduce our costs... etc"
So often senior executive convey a very unclear picture of the change and describe it in terms of generalities. 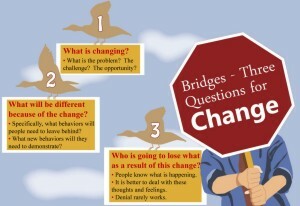 Bridges believes that change leaders need to able to express the change in a clear simple statement that can be expressed in under one minute. This way people will obtain a core understanding of what is changing. - "Sell the problem before you try to sell the solution." William Bridges says: "I go into organizations where a change initiative is well underway, and I ask what will be different when the change is done-and no one can answer the question." "A change may seem very important and very real to the leader, but to the people who have to make it work it seems quite abstract and vague until actual differences that it will make begin to become clear... the drive to get those differences clear should be an important priority on the planners' list of things to do." William Bridges maintains that the situational changes are not as difficult for companies to make as the psychological transitions of the people impacted by the change. He suggests that the transition starts with a loss - a letting go of the old ways of how things were before the change: "...we often say... that you don't cross the line separating change management from transition management until you have asked 'Who will lose [or has lost] what?'" Transition management is all about seeing the situation through the eyes of the other guy. It is a perspective based on empathy. It is management and communication process that recognises and affirms people's realities and works with them to bring them through the transition. Failure to do this, on the part of change leaders, and a denial of the losses and "lettings go" that people are faced with, sows the seeds of mistrust. 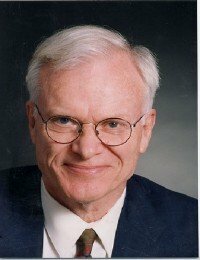 In my view, William Bridges' 3 simple questions are an excellent starting place for addressing the foundational causes of the catastrophic 70% failure rate in change management, and it resonates with and is totally consistent with the holistic and wide view perspective of a programme based approach to change management. Whenever Bridges' team undertake an assignment one of their first assessments is of what he calls "transition readiness". This is important he says as it "provides an important early indicator of what lies ahead, and one of the things we inquire into is the organisation's history of changes, both those that worked and those that didn't." From a change leadership perspective, it is crucial to understand and address the scar tissue left by previous initiatives. The most effective way of doing this is by actions - by demonstrating that you as change leader do understand and care, and that you are taking steps to mitigate the pain. Senior management so often make the mistaken assumption that people automatically accept and adjust to an organisational change. They do this because they are disconnected from the human impact of the organisational change, and because they do not understand that the bigger the change the greater the need for some form of "transitional support". Many directors and senior managers have the emotional detachment and objectivity to make clear, sound strategic decisions yet seem to lack the "counter-balancing" self-awareness and emotional intelligence to realise the impact of their decisions. This omission frequently can delay or jeopardise the execution and implementation of their strategic vision and the realisation of the intended organisational benefits. Bridges: "These executives' detachment from the everyday work-work, which is so often defended as necessary to be 'strategic,' keeps these people from understanding what has to happen for changes to work as planned." The higher you are in your organisation - the more quickly you are likely to move through your own personal transition. You know the intended destination, and have probably known for some while. Most of your people however, will not have this head start. Your people won't "just get it"; they will take at least as long as you did to transition and quite probably a lot longer. Bridges makes the point that it is significant that: "the great leaders, from Moses and Caesar to Lincoln and Lee, were people who deeply understood the people they were leading." He shares this anecdote: "I first realized that after helping a 50,000-person technology company close a fabricating plant. It went very well--they actually doubled productivity per person during the closedown process! But when they called to ask for help in shutting another facility, I discovered that they had 'forgotten' what they had done with the previous shutdown."